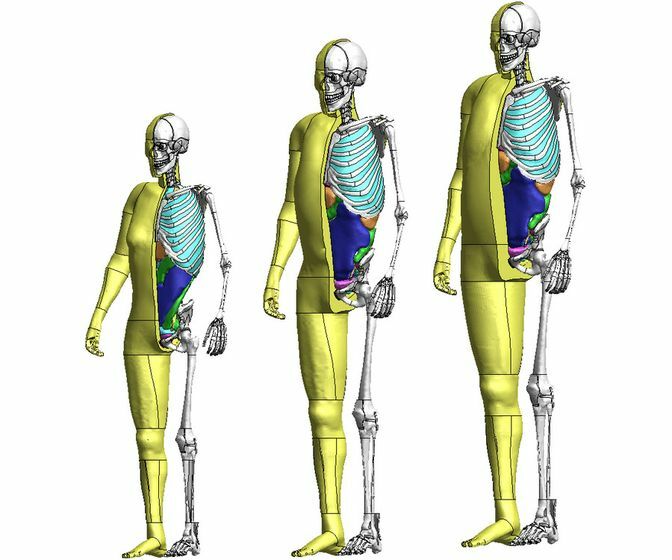 Crash test dummies simulate the body type and weight of a person. While they’ve been helping automakers evaluate the impact on passengers during an automobile crash since the late 1960’s, it has always been difficult to assess how internal organs are affected at the time of a collision. In its quest to better understand vehicle impacts and improve safety systems and design, Toyota decided to tackle the challenge by looking at the crash test dummy structure. The result? Computer-based virtual human models called THUMS (Total Human Model for Safety). Consisting of virtual bone structure, ligaments and tendons to more accurately replicate human bodies, THUMS allow Toyota researchers to analyze driver and passenger injuries in collision simulations. The latest version of THUMS models the impact to internal organs such as the lungs, heart and liver on males of average and large builds, and females of small builds. Future development will feature more body types, including senior citizens and children, for more comprehensive testing. By using THUMS, Toyota has developed better airbags for side oblique collisions and seats that help reduce whiplash injuries. What’s more, in the spirit of collaboration, Toyota shares its information with researchers from around the world, including more than thirty organizations across the automotive industry, to improve vehicle safety.